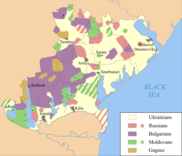 In Ukraine, the number of Bulgarians is estimated at over 140,000 (the 2001 Ukrainian Census counted a total of 204,600 Bulgarians, this including an undetermined number of more recent emigrants), being a majority in Bolhrad District and also inhabiting other districts of Budjak in the Odessa Oblast in the southern part of the country. Many Bulgarians have moved to Odessa, the regional capital in recent years. The modern population of Bulgarians settled in the region at the end of the 18th and beginning of the 19th century, at the time of feudal sedition in the Ottoman Empire and after the Russo-Turkish Wars of the period. Particularly strong waves of emigration emerged after the Russo-Turkish Wars of 1806–1812 and 1828–1829. The settlers came primarily from what is now eastern Bulgaria, but many were also descendants of Bulgarians of the western part of the country that had moved east in and before the 18th century. Among the Bulgarians that emigrated were also a handful of Albanians who also had settled in eastern Bulgaria some time ago. After arriving, the Bulgarians founded their own towns, such as Bolhrad (1819) and Comrat, and around 64 villages. In 1856, after the Treaty of Paris, the region of Bessarabia was divided with the southwestern parts, including Bolhrad, Izmail and Kilia, incorporated into Moldova (since 1861 – Kingdom of Romania), and the northeastern ones, centred on Comrat, remained in the Russian Empire. A Bulgarian gymnasium (school) was founded in Bolhrad on 28 June 1858, which had serious effect on the development of Bulgarian education and culture, and is in fact the first modern Bulgarian gymnasium. In 1861, 20,000 Bulgarians from the Romanian part of Bessarabia moved to Russia, where they were given land in Taurida Governorate to replace the Nogais who had left what was formerly territory of the Crimean Khanate. Those settlers founded another Bulgarian community—the Tauridan Bulgarians. After the whole region was incorporated once again within the bounds of Russia in 1878, the process of Russification grew stronger, as many Bulgarian intellectuals returned to newly established Principality of Bulgaria to help set up the Bulgarian state. The Bulgarian minority was deprived of the rights earned during Romanian control. The whole of Bessarabia was ceded to Romania in 1918 after the Russian Revolution and the collapse of the Russian Empire. In contrast with the previous period of Romanian control, most cultural and educational rights of the Bulgarian minority were taken away which led to cases of armed resistance such as the Tatarbunary Uprising of 1924. The Molotov–Ribbentrop Pact of 1939 led to the June 1940 Soviet ultimatum, an invasion of Soviet forces into Bessarabia, and its inclusion in the Soviet Union. Although being an officially accepted minority under Soviet rule, the local Bulgarians lost some features of their cultural identity in the period. A movement of national revival originated in the 1980s, with Bulgarian newspapers being published, cultural and educational associations being established and Bulgarian being introduced into the local schools especially after the dissolution of the Soviet Union and primarily only as an optional, but later as a compulsory subject. The Association of Bulgarians in Ukraine was founded in 1993.